Sichuan, in China's western hinterland, covers most of the Sichuan Basin. Surrounded by mountains, it is situated at 26'03"-34'20" north latitude and 97'22"-110'10" east longitude with an area of 567,000 square kilometers, accounting for 5.1% of China's total area. Sichuan is high in the west and low in the east in terms of topography. Generally speaking, the western part is plateaus and mountainous regions some 4,000 meters above sea level, while the eastern part features basin and hilly land with an elevation between 1,000 and 3,000 meters. The climate in Sichuan is vastly different between its eastern and western parts. The Sichuan Basin has a humid sub-tropical monsoonal climate, with mild winters, hot summers, long frost-free period, plentiful rainfall and mist, high humidity, and less sunshine. Its average temperature in July, the hottest month, is 25-29oC; in January, the coldest month, 3-8oC. The Western Sichuan Plateau with its plateau climate has lower temperature and less rainfall than the Sichuan Basin, both of which differ again in the southern and northern sections of the plateau. It is divided into 5 districts, 3 autonomous prefectures, 13 prefecture-level cities, 18 county-level cities, 124 counties, and 3 autonomous counties, with a population of 83.29 million as of 2000. Sichuan Cuisine, one of the Eight Great Cuisines in China, emphasizes the use of chili, red hot peppers and garlic. Typical menu items are: Hot Pot, Smoked Duck, Kung Pao Chicken, Twice Cooked Pork, Mapo Tofu. Shuizhu Niurou (steamed beef with a variety of seasonings and spices), Yuxiang Rousi (a roast pork dish cooked with bamboo shoots, mushrooms), Zhangcha Duck (salted, smoked duck), etc. 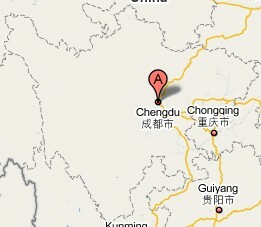 Sichuan Province, Shu for short, is located in southwest China, with Chengdu as its capital city. Sichuan, generally classified as a rice region, abounds in agricultural products. It is listed as one of China's major producers of rice, wheat, cotton, rapeseeds, raw silk, oil-bearing crops, meat, and fruit, and also holds a significant place in production of medicinal herbs, pigs and cattle. Sichuan's major industrial products are metals, coal, petroleum, machinery, electric power, well salt, chemicals, electronics, textiles and foodstuff etc. Sichuan is known as the "Land of Abundance" and has three places listed as the World Cultural and Natural Heritage, namely the Jiuzhaigou Scenic Area, the Huanglong Scenic Area, and Emei Mountain including the Leshan Giant Buddha. Visitors to this province can experience a wide variety of beautiful landscapes including plateaus, mountains, ravines, basins, hills, plains, rivers, lakes, hot springs, waterfalls and limestone caves. Most of the rivers in Sichuan belong to the Yangtze River system. Sichuan is gifted with lush mountains and exquisite waters, and abounds in historical and cultural resources. Its main scenic spots and historical sites include Emei Mountain, Qingcheng Mountain, and Long Valley, the Dujiangyan Irrigation System, Leshan Giant Buddha, and Jiuzhaigou (Nine-Village Valley). The Wolong Nature Reserve in Sichuan is home to the Chengdu Giant Panda Research Base, one of the most important centers in the world for the captive conservation of the Giant Panda. As one of the largest provinces, Sichuan has more than 15 minority groups living with the Han people. Among these are the Yi, Hui, Tibetan and Miao peoples. Each of these minorities has its own charm, ethnic style and folk custom. Some of the ethical festivals like Leshan Great Buddha International Tourist Festival, Southland Ice and Snow Festival, Liangshan Yi Minority Torch Festival and Zigong Lantern Festival have become Sichuan's unique tourist resources.